Ooh, I wonder if that thing still happens when I jump on the-- oh, it does. Neat! Having grown up in the mid-to-late nineties, the florid platformers that trumpeted the 3D capabilities of the PlayStation One made up a generous portion of my childhood, and hold a special place in my heart as the instigators of my gaming proclivities. But I’ll be honest, the 32-bit platformer hasn’t exactly seen the acclaimed resurgence Shovel Knight and Axiom Verge commanded for their 8 and 16-bit predecessors. As has been said of such recent hark-backs as, say, Yooka Laylee or Skylar and Plux, attempts to recreate the collectathon romps of yore have been criticized for feeling archaic, irritating or unpolished. Recently, modernizing the structures that characterized a bygone era of gaming has been – at best – hit and miss. So, what a relief it is to launch into a game in which creating an original concept isn’t a concern. 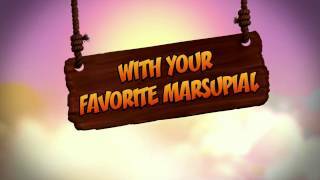 As announced in a campy rendition of Naughty Dog’s original ‘a production by’ intro, Activision and Vicarious Visions have teamed up to pretty up the first three games chronicling not only a prime PlayStation mascot, but one of the flagship franchises of 3D platforming. The N. Sane Trilogy is a fun nod to the Crash Bandicoot series. The N. Sane Trilogy contains remasters of the first three games in the series, those being Crash Bandicoot, Cortex Strikes Back and Warped. Perhaps to be expected, the most noticeable change to the Bandicoot trilogy is how the games look. The angular, polygonal world of the PlayStation is reimagined as a sparklier outback than ever, with cutscenes reaching a depth and nuance previously impossible on older systems. This is especially noticeable in the first game; it’s delightful to watch Cortex’s sleep-deprived eye-twitches, and I found myself chuckling away each time the crazed N. Brio lapsed into eye-rolling gargle-fits. The other two installments tend to emphasize minor details: fur, water and lighting all pop more than they could’ve before, with the half-realistic designs of enemies on par with those of the Skylanders series. Despite the similarity, though, the visuals ultimately succeed alone; executing the humour, melodrama and silliness that was occasionally side-lined by earlier technological restraints. All the while, the airy Bandicoot soundtrack resurfaces here in a decidedly techno redux. As a result, characters often possess a new kind of charm. The bloodthirsty bear that arises during the chase sequences isn’t just terrifying, but rather amusing, while the remastered Pura and Polar attribute an almost Pixar-ish level of cuteness in their stocky, twinkly-eyed designs. Environments also posit that similar pseudo-realistic toon vibe; the underwater levels remind momentarily of Finding Nemo, though always prioritising the zany characteristics unmistakable in Crash. In addition to the lick of paint, some animations have been added here and there for additional goofs: when returning gems and crystals to the warp room, Crash will now regurgitate them from various – occasionally more questionable – areas of his genetically-modified anatomy. The gem-dance stays, though. Thank goodness. As dewy-eyed I am at the newly bespangled visuals, the fact that most the gameplay remains untouched is something of a relief. Like in the original, you are the eponymous Crash; a mutant bandicoot created by the bulb-brained Dr. Neo Cortex. After escaping the kooky experiments of your world-conquering creator, you guide Crash through a series of linear environments, defeating Cortex’s deformed henchmen and snagging various precious items. The collectathon appeal is also retained across the games, such as receiving gems for braving challenging ‘Death Routes’, or relics for completing levels within a time-limit. There are a few changes to behold, though these strike more as minor conveniences embellishing what was already there. 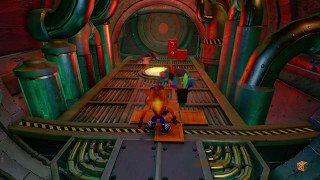 Bosses, for example, are now included in each warp room via special ‘boss doors’, allowing players to grapple with Cortex’s mutant crew as many times as they like. 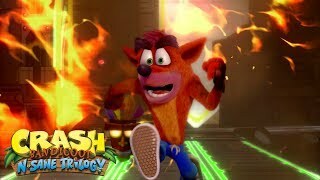 Another neat inclusion is the ability to play as Crash’s sister, Coco, whose unique animations and attacks offer a sparky alternative to the series’ titular mascot. Of course, some stages (such as those involving the jet ski or rideable critters) remain reserved to a specific hero, but from her celebratory air-drumming to powerful booty-slams, Coco is as charismatic as her brother, and alternating between them throughout the N. Sane Trilogy is truly joyous. While most of the appeal still lies in the unerring smugness that accompanies seeing collected gems floating above Crash’s furry noggin, these minor tweaks don’t just permit a reasonably uninterrupted nostalgia-fest, but potentially make the first game more accessible to newcomers. This said, however, it’s also possible that the tropical Wumpa Island may feel a tad simplistic to those more familiar with the intricate designs posited by later classics like Ratchet & Clank or Jak and Daxter. But as was the case in the nineties, the imagination ramps up considerably in the subsequent entries, and if daft, cartoon cheese is your thing, the N. Sane Trilogy will probably have you questioning why you didn’t jump on the Cortex wagon sooner. While the visual upscale made the remaster’s adherence to the originals more obvious, I did occasionally find myself reminded of the frustrations I’d had with the originals. While the first game works admirably to ease the rigidity of the original Crash controls, I noticed the depth-perception issues I’d had with later installments remained. The ancient ruins in Cortex Strikes Back remain the most obvious example, and time trialling can feel fiddly due to missing ledges or misjudging jump-distance. In some cases, the player will actually slip off of ledges after landing; a new issue that can render many of the twitchier levels more embittering than enchanting. As encouraging as it is to see attempts to enfreshen the genre, sometimes it’s best to kick back and revisit the games that helped popularize it. That the N. Sane Trilogy merely reclothes Crash and Co. is perhaps a testament to that notion– and those who grew up with Crash will likely find themselves as enamored by this sunnier outback as its polygonally pointy grandfather. As such, it’s rather obvious that the trilogy’s working mostly from familiarity, meaning those without the emotional attachment to Crash may not necessarily find the trilogy so alluring. As it stands, however, this is a well-executed Crash Bandicoot tribute, and for half the price of the latest Mario or Zelda debacle, the N. Sane Trilogy offers romps aplenty. The PlayStation’s pointy polygons have been slugged with contemporary glitz, with character animations and environments afforded a level of depth and quirky character previously impossible back in the day. Crash feels less wooden than before, though some minor depth-perception issues remain. To my nostalgic relief, controls still feel like Crash, and for the most part, that is fine indeed. A goofy premise, unhinged characters and a simply-addictive progression scheme, the Crash Bandicoot adventure still summons a grin, and the quasi-Pixar upscale only serves to bring the series’ quirky charm back into relevance. Framerate remains mostly smooth across the games, with very minor slowdowns occurring during more…explosive stages. There are some oddities surrounding jumping, however, which can leave deaths feeling cheap and unnecessarily frustrating. While ultimately 'for the fans', Activision and Vicarious Visions successfully bring nostalgic PS One classic romping back into relevance, while including some extra bells and whistles that (save for some control slips) allow the originals a greater depth.